Clinical Demonstration 07 from the Evolution of Psychotherapy 1995 - Practice in Classical Jungian Dream Work; featuring James Hillman, PhD. Clinical Demonstration 09 from the Evolution of Psychotherapy 1995 - Supervision in Gestalt Therapy, featuring Miriam Polster, PhD. 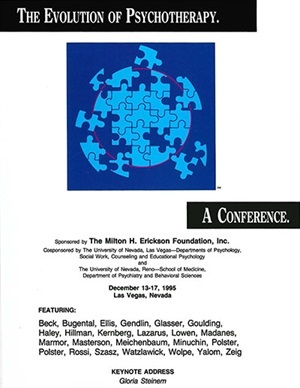 Clinical Demonstration 11 from the Evolution of Psychotherapy 1995 - Humanization of Technique, featuring Erving Polster, PhD. Clinical Demonstration 13 from the Evolution of Psychotherapy 1995 - Demonstration of Rational Emotive Behavior Therapy (REBT), featuring Albert Ellis, PhD and Janet Wolfe, PhD. Clinical Demonstration 14 from the Evolution of Psychotherapy 1995 - Brief Therapy - Redecision Model, featuring Mary Goulding, MSW. Clinical Demonstration 15 from the Evolution of Psychotherapy 1995 - Reality Therapy with a Simulated Client, featuring William Glasser, MD. Clinical Demonstration 16 from the Evolution of Psychotherapy 1995 - Working with the Body in Analytic Therapy, featuring Alexander Lowen, MD.